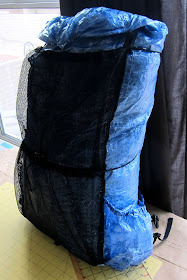 Mountain UltraLight: Make Your Own Cuben Fiber Backpack! 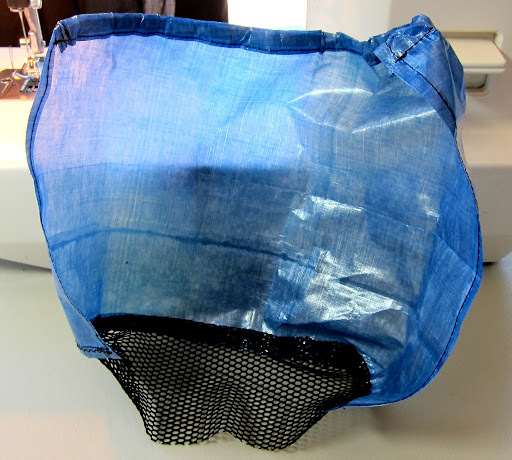 Make Your Own Cuben Fiber Backpack! 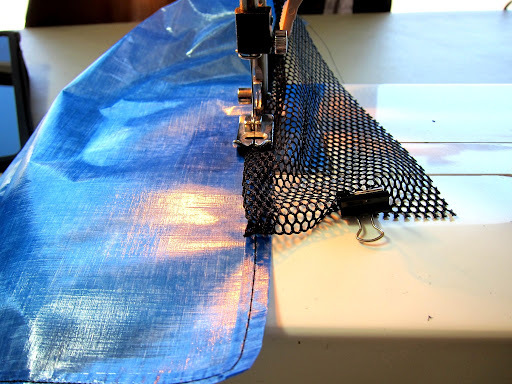 Warning: Making your own gear can be addictive! 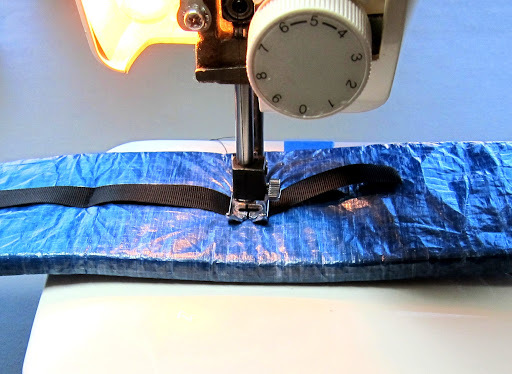 If you've been thinking about making some of your own backpacking gear, I say go for it. All you need are some basic tools (i.e. 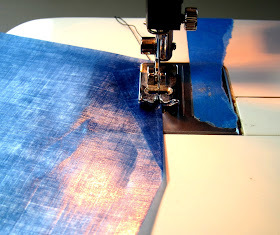 an inexpensive sewing machine and fabric cutting tools) and lots of motivation. 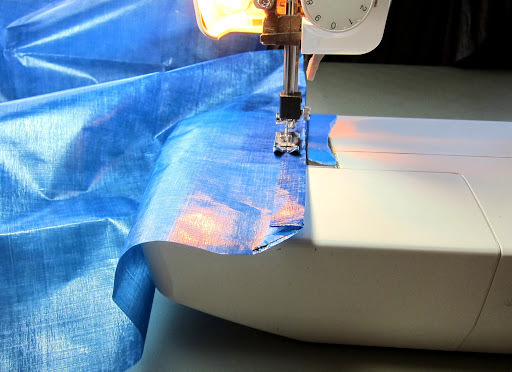 When I started making my own gear, I had never used a sewing machine before. I started with silnylon seconds, a reasonably affordable trail worthy fabric, which was a good choice because I made lots of mistakes teaching myself how to design and sew durable outdoor gear. The first thing you need is a solid plan. 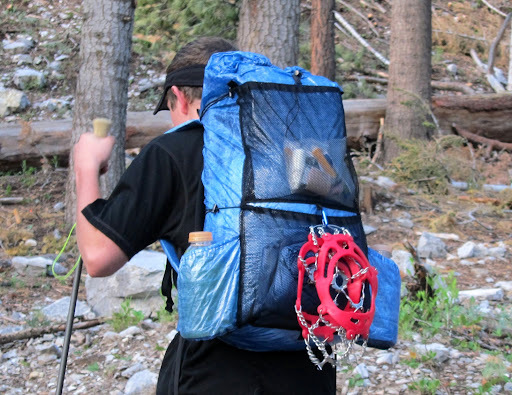 The pack shown here is one I recently made for my son to use on our JMT hike. It's basically the same pack I made for myself over a year ago, with some minor refinements. My goal for this pack, the J3Plus! (ingenious name huh?...John pack, third generation, Plus meaning just a smidge bigger than the original J3) was to make the pack out of just one linear yard of some very expensive 1.43 ounce (per square yard) Cuben Fiber I purchased from ZPacks.com. The diagram below shows how I cut out all the cuben pieces with almost zero waste. You will note that that hip belt doesn't come out of this piece, as my original pack I didn't require one. Like most people, my son likes to use a hip belt, so I bought an additional 1/4 yard of material to make it for him. After cutting out the main pieces, I work on the subassemblies, meaning all the parts that will attach to the main body of the pack. First the shoulder straps. The shape is angled at the top where it attaches to the pack body, allowing the straps to be slanted to match your shoulders. At the bottom, they taper in on the sides. 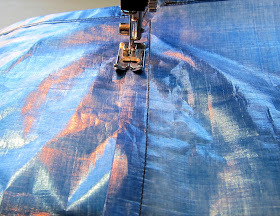 Opening the shoulder straps, I fold the top and bottom edges for a nice clean seamed edge. Notice the top fold is much larger...this is so the material is double thick where it gets sewn to the pack body. Then folding it inside out, I sew the side seam, leaving the top and bottom open for now. Now turning it right side out, I sew the 1/2" webbing onto the bottom that will attach to the ladder lock, making the length adjustable. 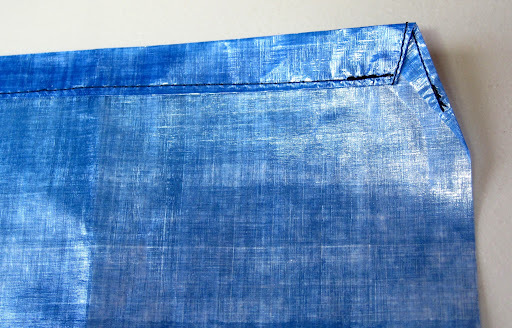 I put the singed edge of the webbing in between the outside layers so it can't rub you wrong anywhere. This is one of those refinements I have made over time. The x-box stitch (not to be confused with a Wii stitch), is a very strong one for an application like this. Then I trace the outline of the strap onto a piece of 3/8" closed cell foam padding (from Gossamer Gear of course...only the best for my packs! 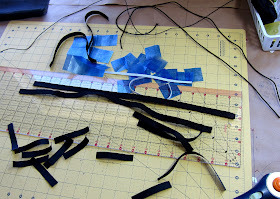 ), and cut it out. 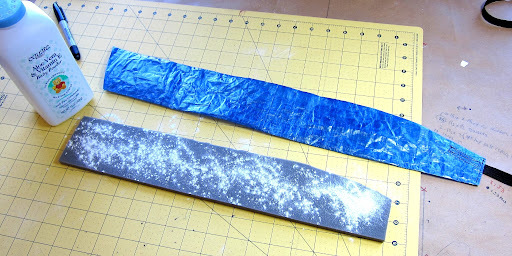 Baby powder is your friend...coat the foam and it will make slipping it into the strap much easier. It smells nice too! 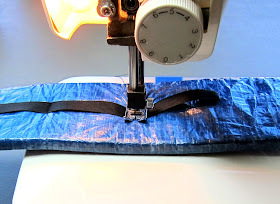 After inserting the padding, I sew some very lightweight 1/2" grosgrain (thinner and lighter than the webbing at the bottom), to make a daisy chain so I have the option to attach things to the shoulder straps. For this I use a series of bar tack stitches. The completed straps are set aside for now, the tops still open. The padded hip belt is made similar to the shoulder strap, tapered slightly down on top, and rounded with the stitch closing in three sides. Turning it right side out, I cut and insert the foam similar to the shoulder straps, this time 1/4" thick padding. The 1/2" ladder lock is attached for the shoulder straps, an upside down design as compared to most packs (Jardine style...keeping any extra strap material out of your arm pits). A quick release buckle is attached with 3/4" webbing to secure the hip belt, and I place the plastic buckle on the side for comfort. Onto the side pockets. 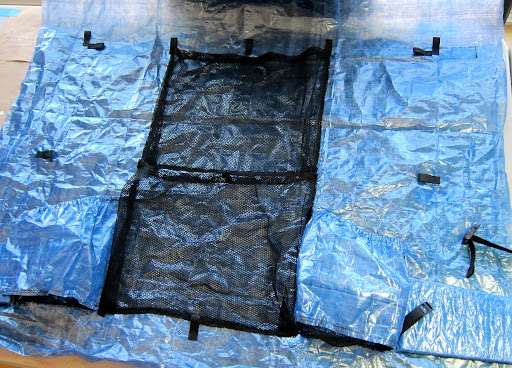 I use the Cuben material for the sides, and some mesh material for the bottom so any rain can run right out. Sewing the rectangular mesh onto the bottom is a bit tricky, and patience is a virtue! The top of the side pocket gets some elastic sewn into the top seam to gather the material, keeping the contents nice and snug. And the completed pocket, angled to be lower in the front so it's easier to reach into without removing your pack. Then I sew them so they stay put. 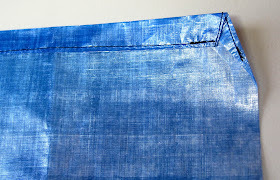 Fold the top down twice, first 1/4", then 1/2", and make a nice long stitch along the bottom. The completed draw cord channel, a beautiful thing. 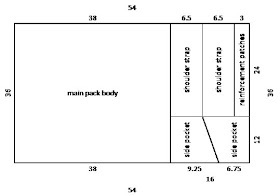 On my first packs I measured and marked directly on the pack where all of the pieces would be attached. Then later I got smart and used a large piece of construction paper to make a full size template. ...and because I can see through the material I am able to easily mark all of the places I will attach things to. Everywhere there is a stress point, top corners of pockets, tie out points, shoulder straps, hip belts, etc, get reinforcement patches sewn to the inside of the pack body. Lots and lots of reinforcement patches! 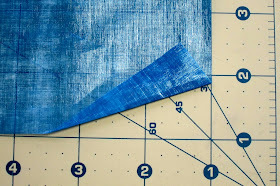 Since I add a lot of tie out points, I've found an easy stitch to use. You basically use a tight zig zag stitch, (not quite a bar tack stitch), and sew forward, then backwards at an angle, and forward again. That way you don't have to turn the material as much, and I've found this to be very strong. All of the tie out points are complete. Now I attach the hip belts using a zig zag box stitch, then I attach the side pockets, overlapping the hip belts. The rear pockets are all mesh, and they overlap the side pockets for a nice clean finish. I love my dual rear pocket design because it makes it easy to keep things organized. Next it's time to close up the pack body. 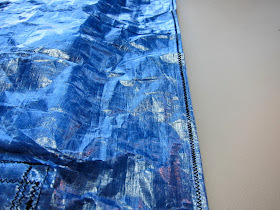 With the pack inside out, make a stitch down the side leaving a 1/2" seam allowance. 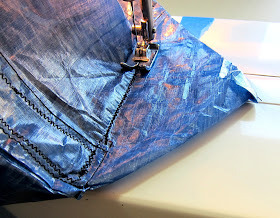 I use a felled seam for the main closure because it's quite strong. 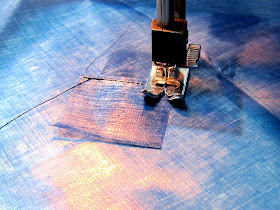 Simply "fell" the end over and sew right through it, attaching it to the pack body. For the bottom, I fold it over then use a zig zag stitch. 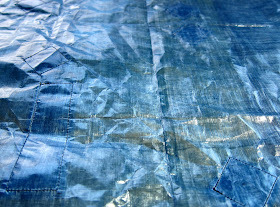 In order to make the bottom of the pack rectangular, I sew the ends, cut off the excess, and do one more stitch. Finally I attach the shoulder straps. 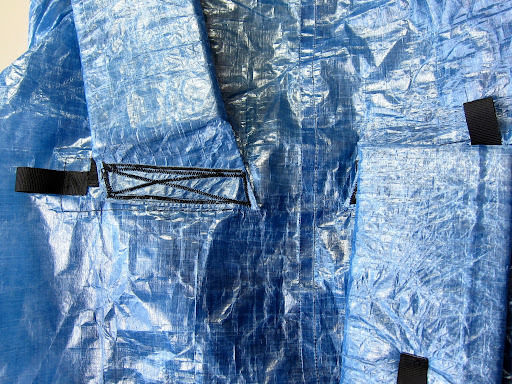 I originally used an x-box stitch, but I found that because the cuben material really doesn't have any give to it, the threads started to rip in this very high stress area. I have since gone to a zig zag x-box stitch and have had no more problems, but I am currently testing some stronger thread. 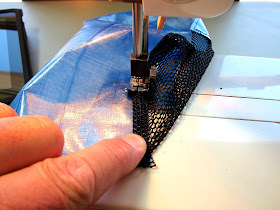 Logically, the more holes in the fabric, the weaker it is, so I want to use less zig zag stitches if possible, making it just that much more durable. Add the draw cord and some shock cord, and the pack is complete. Now get out and use it! FYI this pack is 3,035 cubic inches including the outside pockets, and weighs 6.30 ounces including the sternum strap. Since my son opted not to use the sternum strap, his pack weighs just 5.95 ounces. Not bad for a good size pack worthy of a thru hike! Now that I've given you enough to get started, not exactly step by step instructions, but enough...GO MAKE YOUR OWN GEAR!!! Oh yeah, the fourth generation version of this pack is already in the works. 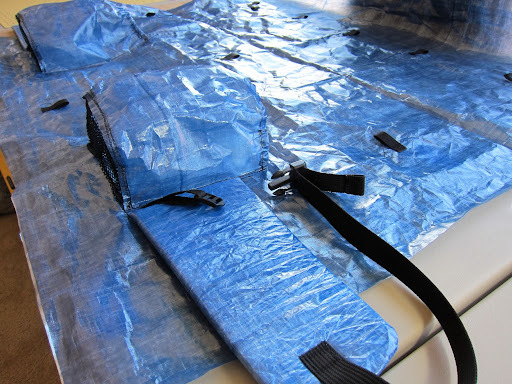 For the new version...contoured shoulder straps, a different top closure, and if all goes well, it will be completely waterproof and still weigh under 8 ounces! Very impressive. High on my priority list for when I get back to the USA. There is NO WAY I could do that even with your clear instructions. I am very, very impressed. Holy crap! That's ambitious my friend and I'll take two! I need something for my 6'6" frame so I may be pushing 9-10 oz? JGG, Paul, thanks for the props! Ewa, you CAN do it if you have the patience! Tim (Trail Sherpa), you're only 4" taller than I am...not a problem and it will be under 8 ounces. I'm sure we can work something out! Mark, not sure I'm ready to start my own company yet...I may be too much of a perfectionist, but who knows? Great work, John! Good luck with it. 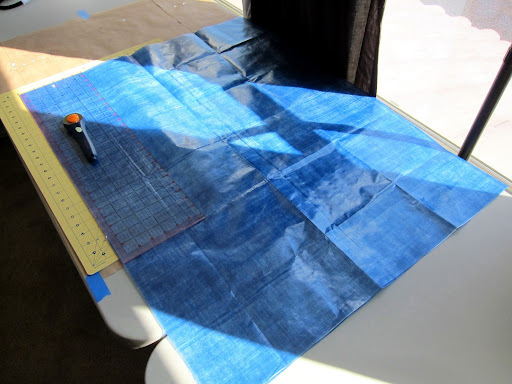 I'm a huge fan of CF but prefer the heavier materials for bushwhacking, and stronger seams. Ryan, I know what you mean about bushwhacking...I've been purposely thrashing my first MYOG cuben pack for about 15 months now, and it's close to retirement. 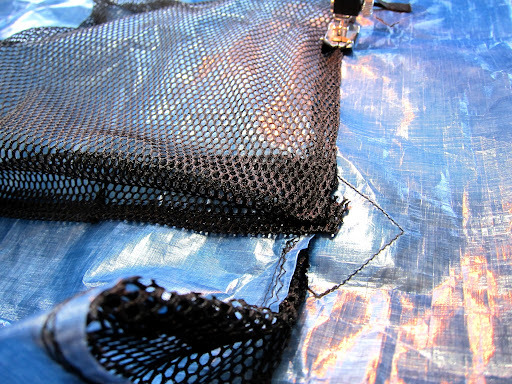 Still, it has lasted way beter than my silnylon packs had...they wouldn't have lasted a month of what I have put this one through. I have been experimenting with different ways to make the seams and stress points stronger, and am am encourage by my recent results. Time to make the next generation pack! Stick, thanks! I can't wait to see the results of your MYOG pack! Wow -- very impressive! I've just discovered your blog from Trail Sherpa -- and am looking forward to more! overlyambitiousme - Welcome, glad you found it! Thanks for sharing how you made your pack. I have cut out all the pieces for my Ray Jardine backpack kit. I've already made a Quilt and tarp from Ray Jardine. I've also made a couple vests from the Thru-Hiker.com kits. Now I'm making my own bags for my bikepacking setup. I'm always looking to learn more so thanks for sharing. Nice to meet another MYOG addict! It's addictive isn't it? Very clear instructions. 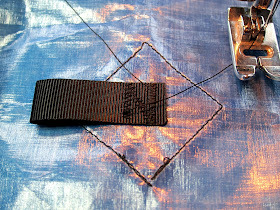 Thank you for demonstrating the excellent sewing techniques. 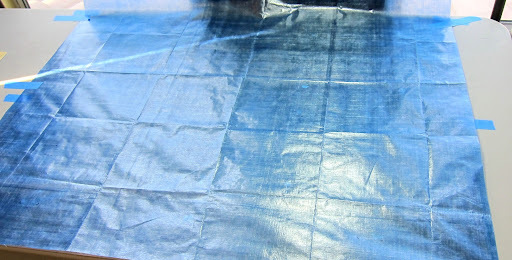 I have sewed cuben before (0.51 oz) and found it easier to sew than silnylon. So I might make a cuben pack as my next sewing project. Thanks again. 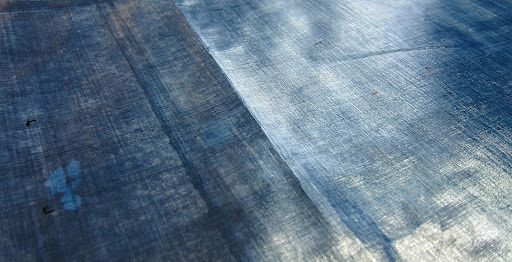 Would sewing with the .74 oz/yd cuben fiber for a tarp work? I ask because the Mountain Laurel Designs states sewing can weaken the fiber. 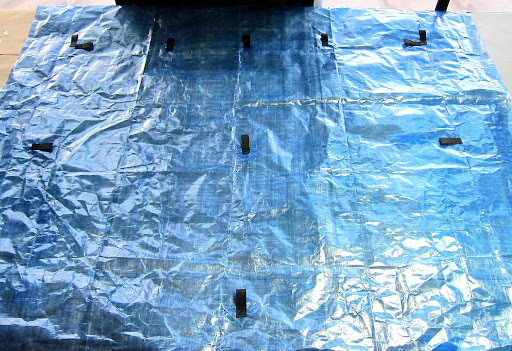 My tarp would have a dewn ridged seam. 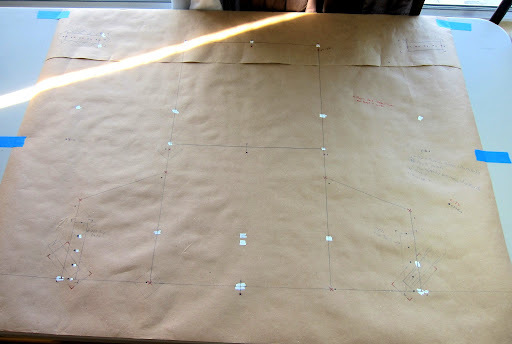 Hi John, can you provide a link to the large cutting mat you are using in the pictures? Great design, btw. Also, which needle size and thread width have you found works best on the 1.43oz cuben. jancuk , sangar tnan rek . i admire with your home made ,nice try boss! Hello, thanks for this, it is awesome. 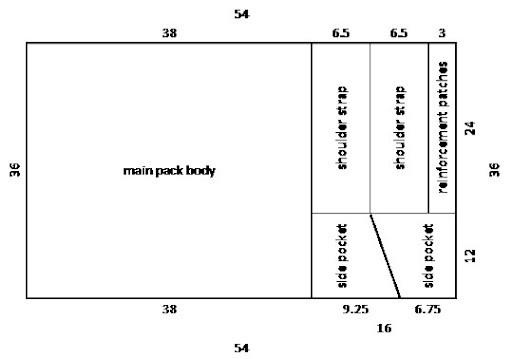 Just wondering, how is the pack doin' since some years now? Thanks! An excellent project. Well done....impressive design and execution. A little jelly of that pack and your skill set. very nice post. I am realy happy to see your post. Thanks so much for your work. This is such a useful tool for writing. It helps me with my story writing. 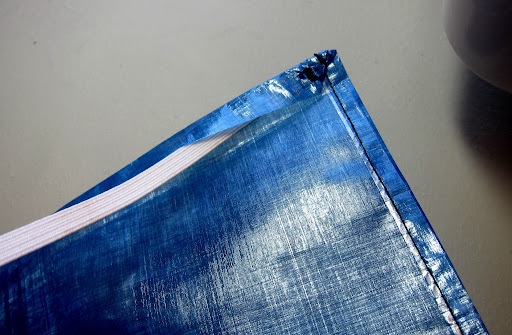 Why not glue rather than stitching? Thanks for the instructions! I'd love to see the next gen pack you are making and instructions for that, too! Also, a list of materials and where to buy them (if not already mentioned). Thanks again! What kind of sewing machine do you use? but also every other animal which feeds on the carcass. Humans have also been killed by coming in contact with poisoned meat, or by eating an animal which had fed on a poisoned carcass. This tool is also used to manage several caterpillars e.g. Spodoptera litura, fruit flies, snails and slugs, crabs etc. I want to give this a shot. I am planning on practicing with less expensive material first, but would like to ask you a few questions. Is there anyway we could get into contact. How do you keep the diy Cuban backpack from drooping down in the back with no load lifters? I tried making one from ripstop nylon ( cheaper for my first try) and it dropped. What padding do you use for the hip and shoulder pieces on the Cuban Fiber diy backpack. Great job for publishing such a beneficial web site Your web log isn’t only useful but it is additionally really creative too There tend to be not many people who can certainly write not so simple posts that artistically Continue the nice writing . How to sight in a rifle scope? وتمتلك شركة نقل عفش بالمدينة المنورة أحدث أنواع الأوناش المخصصة لنقل العفش وبالطبع أفضل و أمهر المهندسين و السائقين المدربين على أعلى مستوى من الخبرة المهنية فإن شعار الشركة هو الأمانة والثقة ولدينا فنيين مختصون بتركيب سراير وطاولات ودولاب حيث تلعب الخبرة دور عظيم بعملية المحافظة على رونق العفش والمحافظة علية فى حالته فقط كل ما عليك هو الاتصال بنا و سنرسل مندوب لمعاينة حجم العفش و حساب التكلفة و مهما كانت النقلة ستنتهي بدون أن تشعر لأنك على وشك التعامل مع الشركة الأولى و الأمثل بين شركات نقل العفش حيث تقدم لك الراحة و الالتزام و المصداقية فى تعاملنا اتصل بنا الآن.